Dimensions 1.25 by 7 by 10 in. Communication in law; United States. Amazon.com description: Product Description: An Advocate Persuades introduces its reader to the role of the advocate and the tools of persuasion. This book, like its predecessor A Lawyer Writes, places the reader in the role of a first-year attorney. Now, that first-year attorney must draft a motion or appellate brief and then present an oral argument. With step-by-step explanations and numerous examples, An Advocate Persuades explains how to develop and refine trial-level and appellate arguments and then how to present those arguments orally. 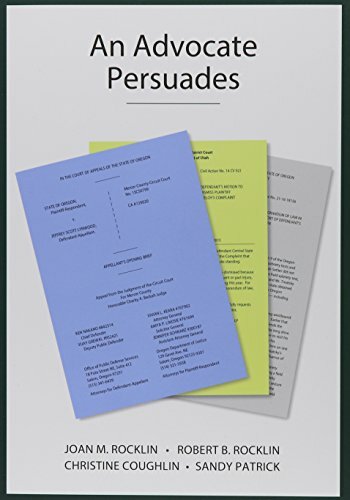 Speaking to its readers in a straightforward manner, An Advocate Persuades communicates both the theories and foundational skills of persuasion so that they will be retained for a lifetime of legal practice. About: An Advocate Persuades introduces its reader to the role of the advocate and the tools of persuasion.